DJ Deck Stand D1 with Speaker Stands. Decks in battle mode?. desk W1220 x D500 x H920 see ourD1B/SS. Manufactured from 18mm MDF with smooth rounded ends ready to wax or paint and a Ply back board for total rigidity! 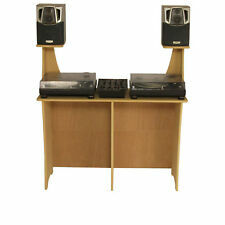 DS1000 - DJ Turn Table Stand. Beautifully finished, Strong & stable, Built by professionals with pride! Want a larger desk?. Check out our DS2000. 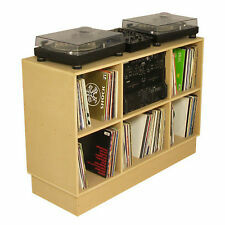 This DJ stand will accommodate 2x 1210s and a standard size mixer like the DJM800. 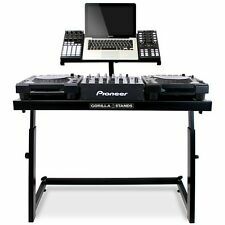 This mobile DJ stand is ideal for mixers, decks, controllers, laptops or other DJ-equipment. The mobile DJ stand is easy to set-up and build out of strong material. 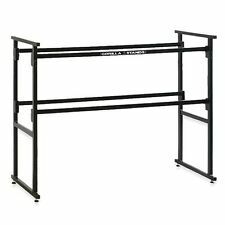 The mobile DJ stand has a nice black finish and is fully in height adjustable. The adjustable deck is ideal for your laptop and other small equipment. Main Features Quick and Easy Set Up Adjustable Deck Fully Height Adjustable Strong Material and Design Build. DS1 - DJ Deck Stand with Included Speaker Stands. Above speaker stands are included (Decks etc are for display only). Rack strip 10u £10. Manufactured from 18mm MDF with smooth rounded ends ready to wax or paint and a Ply back board for total rigidity! DSCD - DJ CDJ Stand with Speaker Stands. The DSCD is designed for 2 Cdj's & Mixer with space below for CD's and amp, 2x CDJ's @320mm Mixer @ 320mm. Laptop and Speaker stands linkhere. Center shelf 704mm wide x 382mm deep x 131 above shelf. 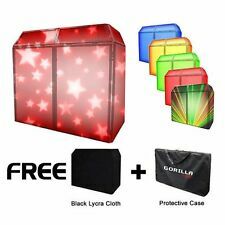 Bag for the (180.055) DB1 Mobile DJ Stand. DJ Booth - DJ-LB1. From the top quality Sound Desk RSP modular range. Constructed entirely of birch ply, all edges rounded and sanded to a fine, silky smooth finish giving a top quality look and feel to this rock solid Stand. An optional case secures the stand and makes transport easy. JJ-T DJ Stand. weight – 16,00kg. 1 x JJ-T STAND. material – steel. available colours - anthracite. deepth – 450mm. DSCD - DJ CDJ Stand. The DSCD is designed for 2 Cdj's & Mixer with space below for CD's and amp, 2x CDJ's @320mm Mixer @ 390mm. Center shelf 704mm wide x 382mm deep x 131 above shelf. AB, BT, CA, DD, HS, IM, IV01-55, JE, KA27-28, KW, LA15-23, PH01-26, PH30-44, PH49-50, PO30-41, TR21-25, ZE. Pro DJ - Dove Desk. 2x cdj or 2x turntable cut outs. Choice of colour. Power lead built in. Beautifully finished, Strong & stable, Built by professionals with pride! 1x mixer cut out. (both can be fitted at extra cost). Dividers and plinths are available in face birch ply, end grain birch ply, textured black and textured white paint. Beautifully finished Birch Ply, Strong & stable, Built by professionals with pride! D1B - Battle Mode Deck Stand with Speaker Stands. leaves 486mm for your mixer! (with 1210's in battle mode). Manufactured from 18mm MDF with smooth rounded ends ready to wax or paint and a Ply back board for total rigidity! Heavy duty lighting bar with in total 20 mounting points for different light effects. 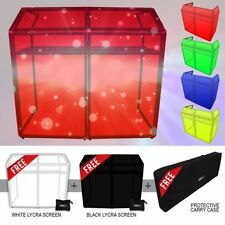 Specially made for Vonyx DB3 Pro DJ Booth System. (180.033).